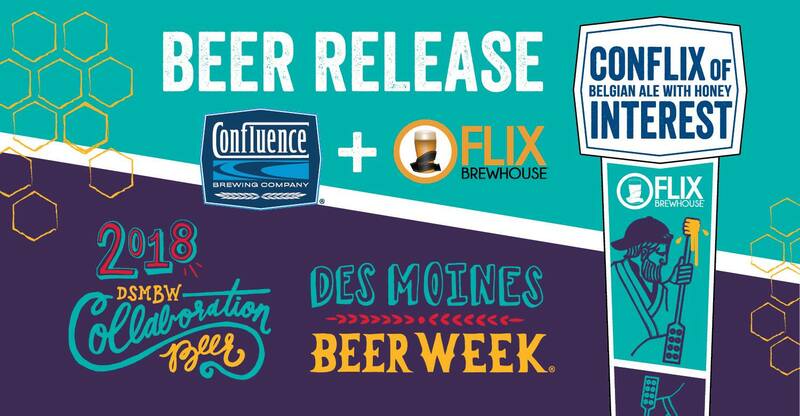 Come to the Confluence taproom to try our Des Moines Beer Week collaboration beer, ConFlix of Interest, brewed with Flix Brewhouse. Some say there are as many ways to brew as there are brewers in the world. You may think then, when two brewers meet, conflicts of interest may arise. Nothing was further from the truth when we got together with our friends at Flix Brewhouse. Gripped by the spirit of collaboration and equally determined to avoid brewing yet another summery pale ale, it took little time for us to agree on a Biere de Garde, specifically a Biere de Miel (literally beer with honey). We designed our friendly brew to capture the essence of centuries of refreshing farmhouse ales. With the addition of local honey and Lemondrop hops, ConFlix of Interest delivers a subtle aroma of lemon, banana and freshly cut hay, while being malt forward with notes of toasted honey and cereal grains. We hope you’ll agree that this beer is the perfect refreshment for your Des Moines Beer Week.